This hotel reflects the dramatic changes that have occurred in Detroit in the last century and a quarter. In 1894, the Flint and Pere Marquette Railroad opened a huge Richardsonian Romanesque depot at the corner of West Fort Street and Third. By 1900, the Pere Marquette—through mergers and acquisitions—became a major Midwestern rail line stretching from Buffalo to Chicago with one line north to Traverse City and branch lines covering Michigan much like the dew. Eventually, the depot served the passenger and mail trains of three other railroads: the Wabash, the Chesapeake and Ohio and the Pennsylvania. The massive station was designed by James Stewart who had worked with the famous Henry Hobson Richardson. By the late 1890s and early 1900s Detroit was a booming industrial metropolis and, by 1912, Henry Ford was perfecting the assembly and sale of his Model T. Business people were coming to Detroit in large number and those who arrived at the Fort Street Union Station needed a nearby place to stay. As a result investors constructed a ten-story hotel at Lafayette and First. This is the shorter of the two buildings pictured here. 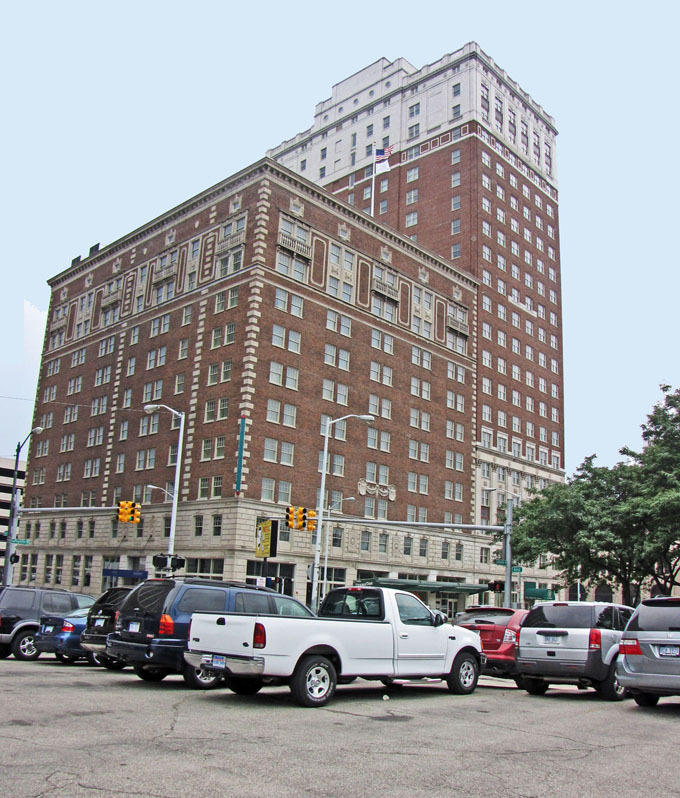 Business prospered and so, in 1927, a 450-room, 21-story tower opened as an addition. Apparently, there were so many guests that the hotel’s owners decided to add a third building at this site. They may have selected an architect but the Depression kyboshed that investment. In 1951, the local owners sold the hotel to the Albert Pick Hotel chain. The hotel was renamed the Albert Pick Fort Shelby. But shortly thereafter, downtown Detroit went into decline as offices, financial services, wholesaling and manufacturing shifted to the suburbs. The hotel chain sold the buildings in 1973 and a local management tried to keep the business open. They had no luck and, in 1974, the hotel closed, seemingly for good. One establishment remained open on the ground floor: The Anchor Bar. This was the preferred and popular watering hole for the writers and administrators who worked at the nearby buildings of the Detroit Free Press and Detroit News. Late in the Twentieth Century, the revival of downtown Detroit began. The Ren Center opened. The Ilitch family renovated the Fox Theater Building and moved the headquarters of Little Caesar’s Pizza there. Then, in 2000, they moved the Detroit Tigers into a downtown ball park. Three casinos helped to attract visitors. Soon, a need arose for downtown hotel rooms. The Doubletree hotel chain took an option on this building in about 2006 and invested about $90 million in the modernization of the Fort Shelby Hotel. In the early 1990s, it was unimaginable that there would be much demand for residential units in downtown Detroit. But when this hotel was remodeled, the architects designed 203 hotel suites for rental and 56 apartments. The Fort Shelby reopened in 2007 after being vacant for 34 years. What about the name Fort Shelby? When Antoine Cadillac arrived in Detroit in late July, 1701, he erected a small fort and named it in honor of Court Ponchatrain, the man who commanded the Navy for King Louis XIV and who had befriended Cadillac. It was a modest fort and, for the most part, the French got along well with Michigan’s Native Americans who sold them furs. The British military defeated the French forces in Québec City in 1859 and Montréal in 1760 and the French Empire in North America was wiped out. The British peacefully occupied Detroit in October, 1760. The British had much more contentious relationships with Native Americans. Chief Pontiac led a siege of Detroit during the summer of 1763. It was long and bloody, but not successful. In 1778, Captain Richard Lernoult headed the British forces stationed in Detroit. Almost all of the Revolutionary War was fought near the East Coast but there were occasionally Revolutionary raiding forces that approached British forts in what was then known as the Northwest. Fearing that Revolutionary forces might attach his modest outpost in Detroit, Captain Lernoult built a larger and more secure fort. He named it for himself. It was located in the area of the Fort Shelby Hotel. After the Revolutionary War ended with the signing of the Treaty of Paris in 1783, the British and the United States continued to contest who would control what were then known as the Northwest Territories. The British maintained their control of Fort Lernoult in Detroit. After United States forces defeated Indians at the Battle of Fallen Timbers near Toledo in August, 1794; the British signed Jay Treaty in November of that year. England peacefully gave up their control of Detroit on July 11, 1796 when Colonel Jean François Hamtramck led U. S. Forces into the city. The United States military continued to use Fort Lernoult. However, in 1801, Secretary of War Henry Dearborn—whose name graces the suburb where the Ford Motor Company is headquartered—decreed that the name of the fort should be changed to Fort Detroit. That was the official name but I believe that Detroit residents and the military continued to use the name Fort Lernoult. In August, 1812, General William Hull surrendered Detroit to the British and was subsequently court martialed and ordered to be hanged for giving up the city to the enemy. In September, 1813, Commander Perry defeated the forces of the British Navy at the Battle of Put-In-Bay on Lake Erie, terminating the British threat in this area. On September 29, 1813, United States General Duncan McArthur led U. S, forces who took over Detroit without any battle. The British had retreated to Ontario where they and their Indian allies led by Chief Tucumseh were defeated by General—and future President William Henry Harrison—at the Battle of the Themes, near Chatham, Ontario, on October 5, 1814. When the United States reoccupied Detroit in 1813, the fort was renamed Fort Shelby in honor of Kentucky governor Isaac Shelby. The War of 1812 was not universally popular in the United States and it proved difficult to recruit men willing to fight. However, Governor Shelby was a very strong supporter of the war and successfully recruited many men who fought with General William Henry Harrison. Hence, the name of the Fort Shelby Hotel. The fort itself, originally constructed by the British in 1778, was centered at the present day corner of Fort and Shelby. The fort was used by the United States military for about 13 years after the War of 1812. It was then sold or given to the city of Detroit and, by about 1827, the fort was razed.